We are proud to present in collaboration with TED a curated series of talks plus specially commissioned educational support materials. Teachers and students can use TED: Understanding Happiness to enhance existing curricula in undergraduate education courses. Educators and students will find activities and multimedia resources which link the study of happiness to the real world, plus expanded academic content such as key terms, related journal articles and classic experiments. For an abridged, interactive version of this content, subscribe to the TED: Understanding Happiness course via the iTunesU course app for iPad by clicking here. Professor Cary Cooper (Lancaster University and co-founder of Robertson-Cooper) frames the TEDTalks in the context of happiness research, and its place in the field of Psychology. 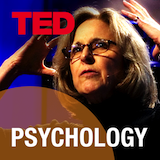 "Among the things that make life in today's world wonderful are TED Lectures, a number of which are directly concerned with positive psychology and the scientific study of what makes life worth living. This 'course' should be highly useful for instructors and students interested in these issues." The surprising science of happiness: are we wired to be happy? Etcoff reviews what we know about the biology of happiness, exploring the structure and chemistry of the reward and pleasure pathways in the brain and the dynamically interacting systems that govern positive and negative reactions to our environment. This "new science of happiness" based on brain research is changing the way Etcoff and her colleagues are thinking about traditional psychotherapy. For transcripts, downloads, and other video options visit TED.com. Martin Seligman, Director of the Positive Psychology Center at the University of Pennsylvania, describes the shift in modern psychology from relieving misery to building happiness. As many psychologists move away from the traditional disease model treatment, is there more than one definition of a happy life and what types of intervention can build sustained happiness? The founder of the positive psychology movement reveals some answers in this powerful TEDTalk. Yale University Professor of Psychology and Cognitive Science Paul Bloom suggests that the pleasure we draw from fine wine, original works of art and hand-tailored suits may not be about status, but instead our beliefs about an object's origins and the human act of its creation. Why we love + cheat: are happiness and love compatible? Biological anthropologist Dr. Helen Fisher believes the human being is not an animal that was built to be happy but rather "we are an animal that was built to reproduce." She describes our irresistible drive to love, and explains why it's not always consistent with happiness. Can we be happy with our second choice, third choice, or no choice at all? The happiness we may find when we don't get what we want-what Harvard psychologist Dan Gilbert calls synthetic happiness-will challenge our basic assumptions about the value of choice, and for some, prove to be profoundly liberating. Psychologist Barry Schwartz draws a line between rising rates of depression and the explosion of choice in almost every moment of modern life. Is freedom of choice as we're experiencing it today too much of a good thing? Schwartz explains why this abundance of options is actually making us miserable. Food industry researcher Howard Moskowitz was in pursuit of the perfect spaghetti sauce. In explaining what Moscowitz discovered, author Malcolm Gladwell makes a light-hearted, but well-articulated case for embracing diversity and choice as a means to greater happiness. Cary Cooper's summary essay will leave you thinking about some of the field's big unanswered questions, and the concluding activities will help you synthesize the content and apply what you've learned.